This is a rematch of a Week 5 district game won by Udall, 22-14, but this time the Eagles will be the home team. Argonia-Attica, fourth-place finishers in District 2, went on the road last week and defeated District 1 champion Sedan, 28-8. The game was a mud fest that was tied 8-8 until Argonia-Attica scored three times in the fourth quarter. Blake Harnden rushed for 102 yards and a pair of touchdowns, while Mason McDaniel added 87 yards and a score. The Titan defense held Sedan to 134 yards of total offense in the game. Udall trailed Oswego 22-20 at halftime before outscoring the Indians 42-6 in the second half for a 62-28 win. Josh Fielder rushed for 181 yards and six touchdowns to lead the Eagles. Fielder has rushed for 1,341 yards and 30 touchdowns this season, while junior Alan Garton has added 557 yards and six scores. In the first meeting, Fielder’s touchdown in the third quarter proved to be the difference in a game that was tied 14-14 at halftime. In that game, Fielder rushed for 133 yards and three scores, while Harnden led A&A with 95 yards on the ground. McDaniel rushed for a score and threw a touchdown pass to Harnden for the Titans. A&A actually outgained Udall 314 to 251 in the game. The Titans are the more balanced team having rushed for 1,551 yards this season and passed for 1,150. Can Argonia-Attica to on the road and flip the script from the first meeting? Madison has posted a four-win improvement off last fall with third-year coach Alex McMillian. The Bulldogs, with their depth and talented non-seniors, have scored 440 points and permitted just 80, third-best in the Division I ranks. Solomon is at 464-130 with a senior-laden team. Madison’s top players include senior Austin Watts, junior Nasun Wasson and sophomore Hunter Engle. Watts and Wasson, both defensive backs, have been excellent in turnover creation. Solomon defeated Maranatha Academy, 52-6, last week. Solomon senior Logan Krause has 1,038 rushing yards and 22 scores, while senior quarterback Braden Neilson has passed for 698, rushed for 744 and accounted for 31 TDs. Solomon is plus-10 in turnover margin. Coach Steve Tiernan has led a three-win improvement for the Gorillas. He is 2-2 in the playoffs with Solomon, though has allowed an average of 53 points a game in those contests. Fourth-ranked South Central is one of the favorites on the eastern side of the bracket and showed why with a 50-0 win over Cedar Vale-Dexter last week. The Timberwolves threw four touchdown passes, three by Chayde Snyder, in beating the Spartans. Snyder passed for 69 yards and tossed TD passes to Ethan Jellison, Gage Girk, and Kelvin Mercer. Girk also threw a touchdown pass back to Snyder. Snyder, the Timberwolves junior quarterback, has passed for 738 yards and 14 touchdowns and rushed for 787 yards and ten more scores. Central Burden advanced to the second round with a 32-12 victory over Caldwell in wet, muddy conditions. The Raiders trailed Caldwell 12-0 in the middle of the third quarter before scoring three times to take control. Senior Tyler Groene rushed for 105 yards and two touchdowns to lead the Raiders, while Clayton Cook added 56 rushing yards and two touchdowns. Canton-Galva, with no seniors, has been one of the state’s surprises with a total score of 444-160, a four-win improvement off last season, and the program’s best record since a 10-1 mark in 2005. Quarterback Landon Everett has more than 1,000 rushing yards, and freshman Tyson Struber has emerged as a leading receiver/defensive back. The Eagles led Lebo 24-6 at halftime last week before pulling away for a 54-6 victory. Canton-Galva only allowed a kickoff return for touchdown against the Wolves. Burlingame defeated Lebo 54-26 the week before. Burlingame heavily relies on its three key seniors: quarterback Montana Giffin, running back/all-purpose threat Seth Greenwood and lineman Keller Snesrud. The Bearcats have a total score of 510-178 and lead the classification in scoring offense. Burlingame’s only loss came in the final seconds for the Lyon County League title, 26-24, to Madison. Giffin has thrown for 1,189 yards with a 17/2 TD/INT ratio. Greenwood has 1,771 all-purpose yards, including 1,143 rushing, and 33 offensive scores. Snesrud has six tackles for loss, and junior Colton Hill has stepped up with 58 tackles and a team-high 15 TFLs. In Week 1, Ness City and Central Plains were tied at 14 before the Oilers scored twice in the final five minutes for a 30-14 victory. Ness City standout quarterback John Pfannenstiel did not play in the contest. The Oilers defeated Victoria, 32-8, in Week 2 and then have posted seven straight shutouts for the state’s top defense. Ness City has a two-point loss to Spearville (16-14) and two weeks ago defeated then-No. 2 Hodgeman County, 28-26. Pfannenstiel is one of eight-man’s top quarterbacks and has a host of weapons, including Easton Seib and Landon Reinhardt. A huge key is the health of standout defensive end/tight end Andres Rios, who hurt his knee at the end of the Hodgeman County game. For Central Plains, senior quarterback Myles Menges has 25 offensive TDs. Senior Grant Heldstab has enjoyed a big year with two fumble recovery for scores, along with 102 tackles and 13 TFLs – all team-highs. One of the premier eight-man matchups features Hoxie, the defending Division I state champions, and Clifton-Clyde, one of four Division I undefeated squads. Last week at home, Hoxie led high-octane Hill City by one at halftime before the Indians pulled away in the second half to win, 46-36. In Week 4, Clifton-Clyde defeated Hill City by the 45-point margin. Hoxie has a total margin of 442-192, while Clifton-Clyde has outscored teams 500-84, albeit against the easiest schedule in Division I. However, Cliton-Clyde also has a big win versus Victoria. Hoxie junior Wylie Weems has 1,605 all-purpose yards, including 173 carries for 1,079 yards and 14 scores. Senior quarterback Jared Kennedy has 25 TDs accounted for. Senior Jarrod Dible has 25.5 TFLs. Sophomore quarterback Aiden Rudolph and senior running back Drake Steinbrock pace the Clifton-Clyde offense. The Eagles have their most victories since a 9-3 season in 2013 and first undefeated first nine weeks since ’07 under longtime coach Russ Steinbrock. The teams have never played each other, according to Kansas Football History. The big rivals from neighboring counties face off for the second time this season. Hodgeman County earned a big win against the Lancers, 54-8, three weeks ago, and ended a four-game losing streak in the series. Then, the Longhorns lost, 28-26, after Ness City made a big comeback. Hodgeman County was stopped inside the 10-yard line on fourth down in the final minute. Last week, the Longhorns pulled away in the fourth quarter to beat Moundridge, 38-20. Hodgeman County has captured 10 straight home games since a 64-34 Week 2 loss to Spearville in 2017. Junior Eli Salmans has 211 carries for 1,454 yards with 18 scores, and sophomore Isaac Salmans has accounted for 30 TD scores. Spearville’s Carson Rich (856 rush) and Kolby Stein (785 rush, 447 pass) have combined for 32 rushing scores. Hodgeman County has scored just 17 more points than the Lancers, but has allowed only 138, 98 fewer than Spearville. This is the first matchup between the schools since at least 1990. Last week, Victoria freshman quarterback Grant Schoenrock stepped in and played admirably in backup duty. The Knights needed a late fourth-down score from Tyler Knoles to beat Wichita County, 34-28. St. Francis had beaten Wichita County, 44-6, in district play. 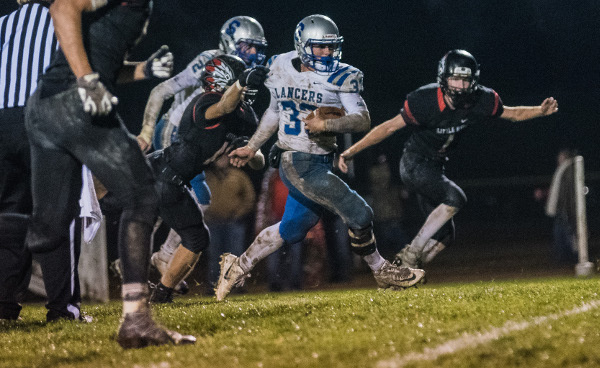 St. Francis, one of the state surprises, has received big years from quarterback Brady Dinkel and running back Jordan Raby under new coach Nick Fawcett. The Indians have moved to the single wing and had multiple new players step up in their first season of varsity action. St. Francis has a total margin of 446-78 and is second best in scoring defense versus the No. 29 SOS. Victoria is at 356-217, though against the No. 2 SOS. St. Paul hosts Centre with a spot in the 8M-II quarterfinals on the line. The Indians pushed their win streak to eight consecutive games with last week’s 62-14 first-round win over Hartford. For St. Paul, Adam Albertini has been nearly uncontainable. The junior back has rushed for 1,814 yards and 40 touchdowns this season. He’s accounted for 51 total touchdowns for the Indians. St. Paul averages 52 points per game on the season while giving up just 20. Centre enters on a four-game win streak. The Cougars have also defeated Hartford (54-6) and are coming off of a narrow, 32-28, victory over Marmaton Valley in the first round. St. Paul defeated Marmaton Valley, 62-14 in Week 6. The Cougars average 48 points per contest while giving up 26. These two sets of Wildcats will meet for the second time in three weeks. Hanover closed out district play with a 46-0 shutout over its Twin Valley League rival, Frankfort. In that meeting, Hanover scored 32 points in the opening quarter to take control. Daiken Stallbaumer rushed for a touchdown and threw a touchdown pass to Thomas Atkins. Atkins also scored on a 14-yard run, and Carter Bruna added two rushing scores for the Wildcats. Frankfort advanced to this round with a second victory over Beloit St. John’s-Tipton this season. The Wildcats beat the Blujays, 30-8, behind 100-yard rushing performances by Garret Dalinghaus and Carson Schreiner. These two Lyon County League rivals will meet for the second time this season. Waverly won the earlier meeting in Week 3, 58-28. Waverly has won seven straight games since a 20-0 loss to Madison. The Bulldogs have scored at least 40 points in each of their eight victories this season, and average 46 points per game. Southern Coffey County earned this rematch by defeating Wakefield, 60-14, last week. Dawson Leimkuhler rushed for 293 yards and five touchdowns in the win over Wakefield to push his season total to 1,513 yards and 29 scores. Leimkuhler rushed for 131 yards and two touchdowns and caught a touchdown pass in the earlier meeting against Waverly. Jett Harvey has passed for 917 yards and 14 scores, and may need a big night if the Titans are to get past Waverly. Both Axtell and Rock Hills have played Hanover. Rock Hills faced Hanover in a non-district game in Week 3, and lost 68-0 while missing key players due to injury. In districts, Hanover needed a comeback to defeat Axtell, 50-42. Hanover has captured 34 straight wins. Rock Hills senior Zane Colson has 140 carries for 1,381 yards and 23 touchdowns. Senior quarterback Dereck Gillett has returned to action and enjoyed his best game of the year last week versus Doniphan West with 7 of 11 passing for 249 yards and four scores. Gillett did not play between Sept. 7 and Oct. 12. Standout junior Rylee Whelchel missed two games this year, though had five offensive touches – all for scores – versus Doniphan West. Axtell’s QB/WR combination of Quinn Buessing and Hunter Koch has enjoyed a huge year. Buessing has a 44/2 TD/INT ratio. Koch is now the eight-man leader for single season and career receiving TDs with 30 this fall and 60 in his career. As long as both teams are healthy, this could be one of the state’s top playoff games. These teams met back in Week 4 with Osborne winning 60-14 at Sylvan-Lucas. Osborne, against Prep Power Index’s No. 4 strength of schedule (SOS) in the classification, has outscored teams 516-182. The Bulldogs are one of four Division II teams to exceed 500 points. While skill players Darnell and Darrien Holloway and Kade Miller receive a lot of the publicity, freshman Mason Schurr has also emerged as an offensive threat. On the other side, Beau Batchman leads the Mustang offense. Sylvan-Lucas has permitted 190 points, eight more than Osborne, but has scored 324 total points. Darnell Holloway has rushed for 1,043 yards and 23 scores, while Darrien is at 1,110 rushing and 22 TDs. Schurr has 662 rushing yards and nine TDs. Miller has seven offensive scores on 46 touches and leads the defense with 79 tackles. Stafford picked up the first playoff win in school history with last week’s 54-28 decision over South Haven. The Trojans have enjoyed a three-win improvement and a substantial offensive improvement to 460 points after only scoring 183 last season. South Barber is one of two Division II teams without a loss, but have tied Otis-Bison. Stafford lost 50-0 to Otis-Bison in Week 3. South Barber, led by junior quarterback Trevor Rooks and senior running back Neal Gugelmeyer, has tallied 516 points. Stafford is led by senior Caleb Hildebrand, who has rushed for 889 yards and 22 TDs. Hildebrand has now going over 2,272 rushing yards with 42 touchdowns for his career. Senior Justice Manning has thrown for 565 yards, rushed for 630 and has accounted for 28 scores. For South Barber, Rooks has passed for 1,072 yards, rushed for 750 and accounted for 36 TDs. Northern Valley defeated Tribune-Greeley County, 74-44, last week. Key players Nick Stutsman and Caden Bach had missed time earlier in the season; however, both played against the Jackrabbits. Stutsman passed for 103 yards with a 3/0 TD/INT ratio and rushed for 83 yards and a score. Bach tallied 16 carries for 191 yards and five scores. Senior Aidan Baird had 25 carries for 154 yards and a TD. Stutsman, Bach and Baird all have between 664 and 747 rushing yards this fall. Dighton, with just nine players, has won six straight after a 1-2 start. Dalton and Blair Hoffman and David Cramer lead the team as multi-year starters; Blair Hoffman has accounted for 38 offensive scores. Dighton has defeated the Huskies 68-18 and 36-20 the last two years. These Cougars have played four common opponents, but the key comparative score is against South Barber, a team known for their passing offense. In Week 3, Central Christian roared back in the second half before a 70-68 three-overtime loss. In Week 6, Oits-Bison and South Barber tied 36-all in a back-and-forth contest that was called at the half because of weather. Otis-Bison has not lost since Week 1. Central Christian has only dropped five games in the last three years, but has taken big playoffs losses in each of the past two seasons. Otis-Bison, led by its running game behind senior lineman Luke Higgason, has averaged 10.3 yards per carry. Quarterback Anton Foust has rushed for 822 yards, passed for 596 and accounted for 34 offensive scores, along with five non-offensive (four kick return) TDs. For Central Christian, junior quarterback Caleb Lambert has thrown for 1,792 yards with a 29/6 TD/INT ratio and leads with 636 rushing and 17 TDs. Lambert’s Cougars lead Division II with 568 points.